The Chamber will be celebrating the joining of our new member, Naskila Gaming, with a ribbon cutting at the Chamber of Commerce. 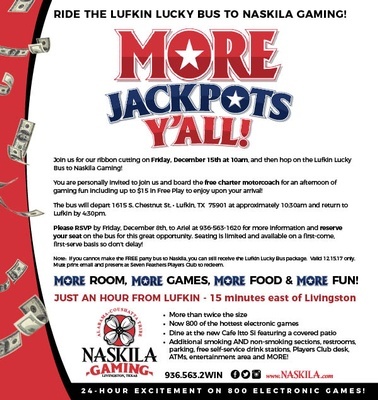 Following the ribbon cutting, Chamber members are invited to hop on the Lucky Bus and head to Livingston for an afternoon of playing at the casino! The bus will leave the CHamber and head to Livingston at 10:30am, and will return to the Chamber in Lufkin no later than 4:30pm. Please RSVP by December 8th to Ariel at (936) 563-1620.